I'm not sure why it's taken us this long to officially get to Gremlins. I've owned the movie for years, but for some reason it never occurred to me I should re-watch and review it as a Christmas movie. It's especially bizarre given how much effort the movie makes to subvert the holiday. It plays with holiday music in a manner similar to what Die Hard would do a few years later. It also utilizes imagery to twist the holiday: look at the eerie green and red lights emanating from the pool when Mohawk jumps in and spawns an army of gremlins. You can even interpret the gremlins themselves as being evil Christmas elves (though that's admittedly a stretch). Gremlins is also at least partially responsible for popularizing the myth that the suicide rate shoots up around the holidays: this is certainly where I first heard it claimed. It's easy to believe, but not remotely true. Suicide rates actually drop in December, and with good reason: who has the time? Setting that aside, the movie is extremely bizarre in tone and concept. It's tempting to compare this to Ghostbusters (also released in 1984), but Evil Dead 2 and Army of Darkness are probably closer matches to the tone. 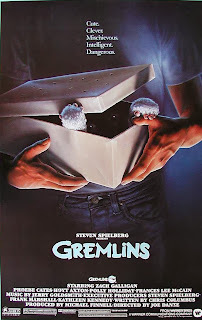 I can't imagine there are many people out there who've never seen Gremlins, but I'll recap just in case: The movie is about a young man who receives a cute, magical pet as a Christmas gift. The pet, called a Mogwai, comes with three rules: one to ensure its safety and two to ensure yours. Exposing the creature to water will cause it to multiply, and feeding the creatures after midnight transform them into horrible, reptilian monsters. The last rule is that sunlight will kill them. The movie doesn't have much plot beyond the obvious: an army of evil creatures are accidentally created and go on a rampage Christmas Eve. The main character, his family, his girlfriend, and the original Mogwai have to stop them. On its own, the premise is fairly common for an 80's movie. But whenever I re-watch it, I'm always surprised just how strange the tone is. It oscillates from outright horror to cartoonish humor at the drop of a hat. The sequence where the main character's mother is alone in a house with four gremlins is as tense as any slasher scene from the era, but other scenes are full of slapstick and zany sound effects. The movie's weirdness largely ties into the concept's roots: stories of gremlins originated in World War II and were quickly adapted into animated shorts. The movie goes to a lot of lengths to pay homage to these; the results are debatable. Opinions on the movie are somewhat mixed. In some circles, it's considered one of the great movies of the 1980's. In others, it's looked at as over-rated. I'm almost inclined to agree with both camps: the movie offers a very unusual spin on Christmas. Unless you interpret the gremlins as evil elves, this is a Christmas fantasy/horror that isn't strictly about a Christmas trope (i.e. : an evil Santa Claus). I can't think of single other movie that fits that meets those criteria. But the movie drags at times. In addition, the characters are underdeveloped, and the movie introduces several subplots that are never resolved (we never find out what happened to the bank VP, for example). In fact, the vast majority of scenes are left ambiguous. A lot of minor characters presumably die, but the PG-rating opens the door for a lot of cuts leaving their fates uncertain. Ultimately, it's a good movie, but a flawed one. It's definitely worth checking out if you're a fan of dark comedy... just be aware it stops short of being great.